The cell surface glycoprotein CD19 and the Src-related protein tyrosine kinase Lyn are key mediators of, respectively, positive and negative signaling in B cells. Despite the apparent opposition of their regulatory functions, a recent model of the biochemical events after B cell receptor (BCR) ligation intimately links the activation of Lyn and CD19. We examined the biochemical consequences of BCR ligation in mouse B cells lacking either Lyn or CD19 for evidence of interaction or codependence. In contrast to published results, we found CD19 phosphorylation after BCR ligation to be unaffected by the absence of Lyn, yet dependent on Src family protein tyrosine kinases as it was inhibited fully by PP2, an Src family-specific inhibitor. Consistent with normal CD19 phosphorylation in lyn−/− B cells, the recruitment of phosphoinositide-3 kinase to CD19 and the ability of CD19 to enhance both intracellular calcium flux and extracellular signal-regulated kinase 1/2 activation after coligation with the BCRs were intact in the absence of Lyn. Similarly, unique functions of Lyn were found to be independent of CD19. CD19−/− B cells were normal for increased Lyn kinase activity after BCR ligation, inhibition of BCR-mediated calcium flux after CD22 coligation, and inhibition of extracellular signal-regulated kinase phosporylation after FcγRIIB coligation. Collectively, these data show that the unique functions of Lyn do not require CD19 and that the signal amplification mediated by CD19 is independent of Lyn. We conclude that the roles of Lyn and CD19 after BCR ligation are independent and opposing, one being primarily inhibitory and the other stimulatory. The developmental fate of B lymphocytes is determined largely by signals emanating from the B cell receptor (BCR).3 Early in development, productive rearrangements at the Ig heavy and light chain loci are required for pre-B cells to reach the immature B cell stage. Entry of immature B cells into the population of mature recirculating B lymphocytes requires the cells to successfully negotiate BCR-mediated negative selection for high-avidity self-reactivity (1, 2) as well as a BCR-mediated positive selection step (3, 4). Persistence of mature B cells is dependent similarly on the presence of a functional BCR (5). B cell involvement in immune responses to exogenous Ags requires the avidity of the interaction between the BCR and the Ag to be greater than a certain threshold value. Signaling through the BCR thus determines both the survival and the reactivity of B cells. It is also clear, however, that the cellular and molecular environment in which BCR ligation occurs can modulate the outcome. T cells, for example, can enhance B cell activation by providing membrane-bound and secreted costimuli such as CD40 ligand and cytokines (6). Similarly, components of the complement cascade such as C3d fragments bound to an Ag can greatly increase the B cell response by coligating the complex comprising CD21, CD19, and Leu-18 with the BCR (7, 8). Conversely, coligation of FcγRIIB1 with the BCR via the Fc regions of Ig bound to Ag can inhibit B cell reactivity (9). That is, receptors on the surface of the B cell that sense the context in which BCR engagement occurs can positively and negatively modulate the signal delivered through the BCR and thus may be critical in determining the outcome, be that activation, differentiation, or death. The molecular pathways emanating from the BCR and its accessory molecules are becoming increasingly well defined. BCR cross-linking results in the rapid activation of Src-related protein tyrosine kinases (PTKs), of which Lyn is predominant in mouse B cells. Active Src-PTKs facilitate the phosphorylation and consequent activation of Syk, the dominant PTK in B lymphocytes. The positive role of Lyn in Syk activation in mouse B cells does not appear to be unique because in the absence of Lyn, Syk activation occurs, albeit at a reduced rate (10, 11). Active Syk efficiently phosphorylates numerous intracellular substrates mediating B cell activation, including Igα, Igβ, and various adaptor proteins including B cell linker protein and phospholipase Cγ (12). These molecules in turn mediate a cascade of events resulting in release of Ca2+ from intracellular stores, activation and nuclear localization of NF-AT and NF-κB, and if the conditions are correct, mitogenesis. CD19 exerts its positive effect on BCR signaling by the phosphorylation-dependent recruitment of Vav and phosphotidylinositol-3 kinase (PI3K), which in turn enhances Ca flux, activation of the extracellular signal-regulated kinase 1/2 (ERK1/2), and ultimately B cell proliferation (8, 13, 14). CD19 deficiency results in a hyporesponsive B cell phenotype in which activation mediated by BCR cross-linking and T cell-dependent immune responses are compromised to varying degrees (15, 16). Ligation of the BCR also initiates negative regulatory cascades that often involve the recruitment of phosphatases to BCR-proximal molecules. For example, coligation of CD22 with the BCR results in it being phosphorylated on tyrosines contained within immunoreceptor tyrosine-based inhibitory motifs (ITIMs) that serve as binding sites for the Src homology 2 domain containing phosphatase 1(SHP-1) (17). SHP-1 is active in dephosphorylating many of the signal transduction molecules proximal to the BCR such as Syk, B cell linker protein, and Igα/β (18). Phosphorylation of tyrosines within the ITIM of several B cell negative regulatory molecules such as CD22, CD72, and paired Ig-like rceptor B has been found to depend on Lyn (11, 19, 20, 21, 22, 23). Loss of these molecules results in a hyperresponsive B cell phenotype and autoimmunity (24, 25, 26), as is also the case for loss of Lyn (10, 27, 28), although the phenotypes are not identical. Thus, biochemical and cellular studies have defined unique roles for Lyn in inhibiting BCR signaling. The role of Lyn in promoting BCR signaling through phosphorylation of immunoreceptor tyrosine-based activation motifs in Igα/β does not appear to be unique (10, 29), presumably due to the activity of other Src-related PTKs in B cells such as Fyn and Blk. Given that most experimental data have defined almost diametrically opposing functions for CD19 and Lyn in regulating B cell activation, two recent observations came as somewhat of a surprise. These findings were that 1) the initial phosphorylation of CD19 was entirely dependent on Lyn (30) and 2) increased Lyn activity in stimulated B cells was dependent on the presence of an amplification loop centered on tyrosine phosphorylation of CD19 (30, 31). Given this proposed interrelationship between Lyn and CD19 in B cell activation, we endeavored to more clearly define the molecular basis and consequences of this interaction. We have re-examined the relationship between CD19 and Lyn and found that the pathways in which these two molecules participate in an obligatory manner are essentially independent of each other. The generation and characterization of Lyn-deficient and CD19-deficient mice have been described (16, 28). Both mutations have been backcrossed onto the C57BL/6 background for >10 generations. C57BL/6 mice were used as controls. Abs used in this study were as follows: mAbs specific for CD19 (1D3), FcγR (2.4G2), CD45R (RA3-6B2), CD22.2 (Cy34), Igκ (187.1), Thy-1 (30H12), CD4 (3155), CD8 (RL172.4), CD5 (53.7.3), and phospho-tyrosine (4G10; Upstate Biotechnology, Lake Placid, NY). Rabbit anti-Lyn serum and rabbit anti-ERK2 were purchased from Santa Cruz Biotechnology (Santa Cruz, CA), whereas anti-phospho-ERK1/2 was purchased from Cell Signaling (Beverly, MA). The Src kinase-specific inhibitor PP2 (32) and the control drug PP3 were obtained from Calbiochem (San Diego, CA). Rabbit anti-serum specific for the cytoplasmic domain of CD19 was a gift from Dr. J. Bolen (Millenium Pharmaceuticals, Boston, MA). F(ab′)2 goat anti-mouse IgM was purchased from Jackson ImmunoResearch Laboratories (West Grove, PA) and intact goat anti-mouse IgM was from Southern Biotechnology Associates (Birmingham, AL). Single cell suspensions were prepared by cutting spleens into small pieces before gently pushing the fragments through a wire sieve. RBCs were removed by incubation for 1 min in red cell removal buffer (168 mM NH4Cl) at room temperature, washed with ice-cold PBS, and then resuspended in PBS containing 3% FCS (PBS/FCS). Aggregates were removed by passage through nylon mesh. B cells were enriched by complement-mediated killing of T cells using mAbs specific for Thy-1, CD4, and CD8 plus rabbit complement (C6 Diagnostics, Germantown, WI) at 37°C with 10% CO2 for 40 min. B cell purity was determined by flow cytometry after staining with anti-B220, performed as described (33) using a FACScan (BD Biosciences, San Jose, CA) with dead cells excluded by propidium iodide uptake. Purity of viable B cells after these procedures was routinely >90% for all strains. In the experiments described in Figs. 6⇓ and 7⇓, D and E, splenic B cells were enriched by direct purification using MACS magnetic beads directly conjugated to anti-B220 (RA3-6B2), following the manufacturer’s directions (Miltenyi Biotec, Bergisch Gladbach, Germany) and using a MACS LS column. B cell purity was determined by flow cytometry to be >98%. Purified B cells (20–30 × 106) were resuspended in PBS at 37°C. In general, B cells were stimulated with F(ab′)2 goat anti-mouse IgM at a final concentration of 40 μg/ml for various times and were subsequently lysed on ice for 30 min in Triton X-100 buffer (1% Triton X-100, 150 mM NaCl, 50 mM Tris-HCl, pH 7.5) or RIPA buffer (1% Triton X-100, 1% deoxycholate, 0.1% SDS, 150 mM NaCl, 20 mM Tris, pH 7.5), both in the presence of 1× complete protease inhibitor (Roche Diagnostics, Mannheim, Germany). Coligation of the BCR with CD19 was done by staining B cells with biotinylated mAbs specific for Igκ and CD19, either alone or together. Cross-linking was achieved by addition of avidin to a final concentration of 20 μg/ml. FcγR binding was blocked by saturating concentrations of 2.4G2. For FcγRIIB coligation, purified splenic B cells were treated with buffer alone, F(ab′)2 goat anti-mouse IgM at 40 μg/ml, or intact goat anti-mouse IgM at 60 μg/ml, giving equimolar stimulation for 2 min at 37°C before lysis. Where total cell lysates were analyzed, 2 × 106 cell equivalents were added to each lane. For immunoprecipitations, cell lysates were incubated with the optimal concentration of a biotinylated mAb for 2 h at 4°C, followed by streptavidin Sepharose beads (Amersham Phamacia Biotech, Uppsala, Sweden) for an additional hour. The immunoprecipitates were washed with lysis buffer three times and eluted by addition of an equal volume of 2× SDS sample buffer containing 2.5% 2-ME and heating for 5 min at 95°C. Src kinases were inhibited by the addition of PP2 or the control drug PP3, to a final concentration of 10 μm for 20 min at 37°C before 2 min of BCR stimulation using F(ab′)2 anti-IgM at 40 μg/ml. Spleen cells were loaded with indo-1 acetoxymethyl (Molecular Probes, Eugene, OR) as described (19). After loading, cells were stained with fluorochrome-labeled anti-B220 and biotinylated anti-κ alone or together with either biotinylated anti-CD22 or biotinylated anti-CD19. Staining was conducted in the presence of saturating concentrations of 2.4G2 to prevent FcγR binding. After washing and resuspension at ∼107 cells/ml, baseline fluorescence was established using a MoFlo (Cytomation, Fort Collins, CO). BCR ligation alone or coligation with either CD22 or CD19 was initiated by addition of avidin to a final concentration of 20 μg/ml. The subsequent calcium flux was followed for the indicated times on B cells identified by their fluorescence. Cell lysates or precipitated proteins were separated by electrophoresis through either 4–20% gradient or 10% constant gels (Gradipore, Sydney, Australia) and were subsequently transferred to nitrocellulose membranes (Amersham Pharmacia Biotech). Blots were blocked with buffer containing 3% BSA at room temperature for 1 h and then incubated with primary Abs against the proteins of interest overnight at 4°C. After extensive washing, primary Abs were revealed by incubation with HRP-conjugated anti-rabbit serum (Silenus, Hawthorn, Australia) or anti-mouse IgG serum (Southern Biotechnology Associates). To verify equivalent protein loading, blots were stripped and reprobed with appropriate Abs. For quantitation of band intensities, nonsaturating exposures were scanned and the density of the band was determined using a Computing Densitometer (Molecular Dynamics, Sunnyvale, CA). Purified splenic B cells from control and CD19−/− mice were stimulated for 0 or 2 min with 40 μg/ml F(ab′)2 anti-IgM and then lysed by the addition of ice-cold lysis buffer (100 mM NaCl, 10 mM Tris-HCl, pH 7.5, 1% Nonidet P-40, 2 mM EDTA, 0.1 mM NaVO4, 10 mM MgCl2, and 1× complete protease inhibitor mixture; Roche Diagnostics). Cell lysates (100 μg/assay) were precleared with 60 μl of 50% protein A-Sepharose slurry, and then Lyn was immunoprecipitated with 0.6 μg of anti-Lyn serum (Santa Cruz Biotechnology) and protein A Sepharose. After washing, enzyme assays were conducted at 30°C for 7.5 min in 30 μl of kinase buffer (25 mM Tris, pH 7.5, 0.5 mM DTT, 0.1 mM NaVO4, 50 μM cold ATP, 10 mM MgCl2, 0.25 ml of [γ-32P]ATP, specific activity 2800 cpm/pmol) and 5 μM Src-optimal peptide (SOP; AEEEIYGEFEAKKKK) (34). The reaction was terminated by brief centrifugation followed by spotting 20 μl of supernatant onto Whatman P81 chromatography paper (Clifton, NJ). Unincorporated [γ-32P]ATP was eliminated by one 10-min wash and two 5-min washes in 0.4% orthophosphoric acid followed by a 5-min wash in 100% ethanol. The phosphorylated peptide bound to the paper was immersed in beta counter scintillation fluid and counted (Packard Instruments, Downers Grove, IL). Kinase assays were conducted in triplicate and activity was expressed in cpm. The amount of Lyn present in each assay was determined by eluting Lyn from the beads followed by SDS gel electrophoresis and Western blot analysis. Assays were normalized for Lyn content as measured by densitometry. The experiment itself was repeated twice. To determine whether CD19 expression was intact in lyn−/− splenic B cells, cell surface levels on both Lyn-deficient and control B cells were measured using flow cytometry. No difference was found (Fig. 1⇓A). It has been reported that tyrosine phosphorylation of CD19 is compromised in Lyn-deficient B cells after BCR ligation (30). To confirm this observation, we measured the tyrosine phosphorylation status of CD19 in lyn+/+ and lyn−/− splenic B cells immediately before or 1 and 5 min after BCR cross-linking with a F(ab′)2 polyclonal anti-IgM reagent. Contrary to published results (30), we found no difference in the level or rate of CD19 phosphorylation in lyn−/− B cells after BCR ligation when compared with control B cells (Fig. 1⇓, C and D). Furthermore, using Lyn-sufficient and deficient B cell lines, we observed normal BCR-inducible phosphorylation of CD19 through 25 min of stimulation (Fig. 1⇓C). These data demonstrate clearly that the presence of Lyn is not obligatory for CD19 phosphorylation in mouse B cells. CD19 surface expression and phosphorylation in B cells from wild-type and lyn−/− mice. A, CD19 expression on splenic B cells from control and Lyn-deficient mice detected using FITC-conjugated anti-CD19 Ab. B, Verification of anti-CD19 reagents used in this work. An isotype control mAb (RA3-6B2) does not precipitate protein reactive with the anti-CD19 serum, and CD19−/− B cells do not contain protein reactive with the immunoprecipitating mAb and anti-CD19 serum. C, CD19 phosphorylation in control and lyn−/− B cells. Purified splenic B cells (20 × 106/time point) were stimulated with F(ab′)2 anti-IgM for the indicated times, lysed, and CD19 immunoprecipitated. Immunoprecipitated proteins were probed with the anti-phosphotyrosine Ab 4G10. All blots were subsequently stripped and reprobed with rabbit anti-CD19 to allow quantification of the amount of CD19 within the immunoprecipitate. Shown here are representative results from at least three experiments. A similar analysis of F(ab′)2 anti-IgM-stimulated lyn−/− and lyn+/+ B cell lines was conducted for 25 min, giving an identical result. D, Signals obtained from the Western blots of primary B cells were quantified by densitometry, and the mean ± SE of the ratio of the intensity of the anti-phosphotyrosine and anti-CD19 signals at each time point from three independent experiments were plotted, permitting a comparison of the relative tyrosine phosphorylation of CD19 in primary B cells from lyn+/+ and lyn−/− mice. BCR cross-linking induces tyrosine phosphorylation of CD19, whereas cross-linking CD19 alone does not (35, 36). The PTK responsible for CD19 phosphorylation, therefore, is presumed to be BCR-associated, with Lyn and Syk being prime candidates. Because we have shown CD19 phosphorylation to be normal in the absence of Lyn, we wished to determine whether the kinase responsible was either an Src family PTK or Syk. Therefore, we stimulated lyn−/− and control B cell lines with F(ab′)2 anti-IgM in the presence of the Src family specific inhibitor PP2 (32) and then determined the extent of CD19 phosphorylation. Fig. 2⇓A shows that in both lyn−/− and lyn+/+ B cell lines the BCR-induced phosphorylation of CD19 is inhibited completely by PP2 but is unaffected by the control drug, PP3. CD19 is a substrate of Src family PTK activity. A, Control and Lyn-deficient B cell lines were untreated or pretreated with either PP2 or the control compound PP3 before BCR stimulation with F(ab′)2 anti-IgM. CD19 immunoprecipitates were blotted sequentially with anti-phosphotyrosine Ab and then anti-CD19 serum as described in Fig. 1⇑. B, Lyn constitutively associates with CD19 in a control B cell line. 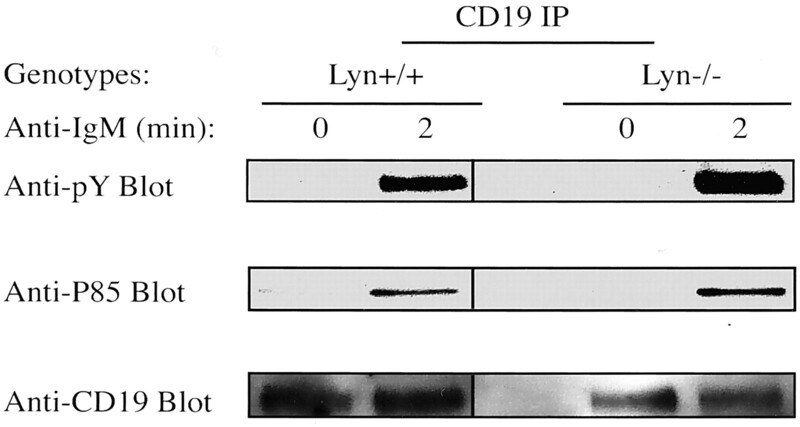 CD19 was immunoprecipitated from a lyn+/+ B cell line after the indicated time of stimulation, and the Western blot was probed sequentially for phosphotyrosine (upper left panel), CD19 (middle left panel), and Lyn (lower left panel). A control Ab failed to precipitate Lyn from the lyn+/+ B cell line, either unstimulated or stimulated (upper right panel). Lyn was detectable in the total cell lysate (TCL) and is indicated by the arrow. C, CD19 phosphorylation is constitutive and inducible in a Lyn+/up B cell line. Control and Lyn+/up B cell lines were stimulated, lysed, and CD19 immunoprecipitated. Phospho-CD19 was revealed with anti-phosphotyrosine Ab and total CD19 by reprobing with rabbit anti-CD19 serum. A number of reports implicate Lyn as the PTK responsible for CD19 phosphorylation in Lyn-sufficient B cells (37, 38). 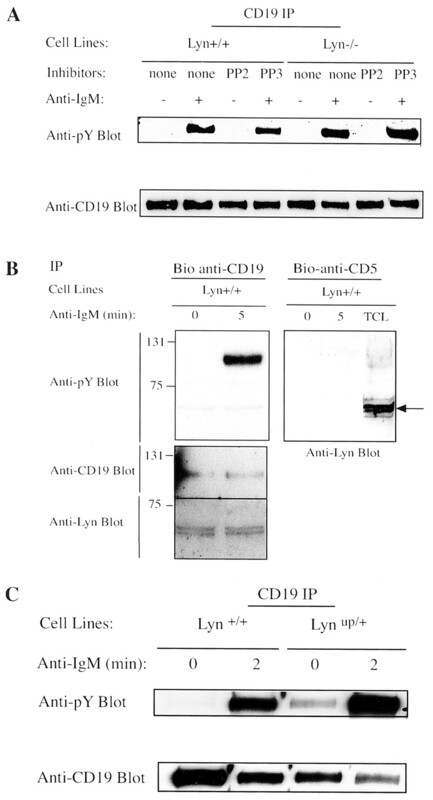 In agreement with these observations, an anti-Lyn Western blot of immunoprecipitated CD19 from both unstimulated and stimulated lyn+/+ B cells showed coimmunoprecipitation of Lyn (Fig. 2⇑B). A similar examination failed to detect coimmunoprecipitation of Hck, Blk, or Fyn with CD19 from either lyn−/− or lyn+/+ B cell lines, suggesting the association was either transient or at a low stoichiometry (data not shown). Immunoprecipitation with an irrelevant Ab, isotype matched for the anti-CD19, did not precipitate Lyn, demonstrating the specificity of the anti-CD19 reaction (Fig. 2⇑B). Although our data indicate that an Src-related PTK is responsible for CD19 phosphorylation in the absence of Lyn (Fig. 2⇑A), we are unable to identify the specific PTK involved. We also examined CD19 phosphorylation in a B cell line carrying a genetic modification encoding a constitutively activated form of Lyn (lyn+/up; Y508F) (39). Although BCR cross-linking is required to induce phosphorylation of CD19 in the control B cell line, tyrosine phosphorylation of CD19 was detected in the unstimulated lyn+/up B cell line and was enhanced by BCR cross-linking (Fig. 2⇑C). Collectively, these results strongly support a role for Lyn in CD19 phosphorylation after BCR ligation. These data also suggest, however, that in the absence of Lyn, other members of the Src family mediate the BCR-induced phosphorylation of CD19. The relative contribution of other Src family PTKs in wild-type or Lyn-deficient B cells cannot be resolved at present. The costimulatory role of CD19 in B cell activation is mediated by the recruitment of the signaling molecules such as PI3K to tyrosine phosphorylation sites on CD19 (40, 41). Although we have shown that other Src family PTKs can compensate for the absence of Lyn in BCR-dependent phosphorylation of CD19, Lyn might still be essential for recruitment of specific effector signaling molecules to the cytoplasmic domain of CD19. To test this possibility, we immunoprecipitated CD19 from resting and stimulated lyn+/+ and lyn−/− primary B cells and looked for coprecipitation of PI3K. We found that PI3K was recruited to CD19 equally well in lyn−/− and lyn+/+ primary B cells after BCR ligation (Fig. 3⇓). Recruitment of PI3K to CD19 is thought to be important in the enhanced calcium flux engendered by BCR and CD19 coligation (42). Therefore, we tested the functional relevance of PI3K recruitment to CD19 in lyn−/− splenic B cells by comparing the calcium flux induced by BCR ligation alone with that induced by coligation of the BCR with CD19. As expected, in control B cells, coligation of CD19 with the BCR induced a higher calcium flux than did BCR ligation alone (Fig. 4⇓A). Importantly, we observed a similarly enhanced calcium flux upon BCR and CD19 coligation in lyn−/− B cells (Fig. 4⇓B), indicating that the absence of Lyn affects neither the CD19-dependent recruitment nor function of effector molecules essential for the mobilization of Ca2+. Recruitment of PI3K to CD19 is intact in lyn−/− B cells. Purified splenic B cells from control and lyn−/− mice were stimulated for the indicated times. CD19 was immunoprecipitated and the Western blot was probed with anti-phosphotyrosine (upper panel) and rabbit anti-PI3K serum (middle panel). After stripping, the blot was reprobed with rabbit anti-CD19 to reveal the amount of CD19 loaded (lower panel). Coligation of the BCR with CD19 enhances Ca2+ flux in control and lyn−/− B cells. Splenocytes from control (A) or lyn−/− mice (B), loaded with the calcium-sensitive dye indo-1, were stained with biotinylated mAbs specific for Igκ alone or together with anti-CD19 as indicated. B cells, specifically labeled with FITC-conjugated anti-B220, were analyzed by flow cytometry. After establishing baseline fluorescence, cross-linking was initiated by addition of avidin (indicated by the vertical arrow), and the analysis continued for the times indicated. The plots represent the fluorescence ratio of gated B220+ cells. The result shown is from one of three independent experiments. Previous analyses have demonstrated no effect of anti-B220 staining on Ca2+ flux (Ref. 19 and data not shown). Besides raising calcium flux, coligation of CD19 with the BCR can also enhance the activation of MAPK (14). To determine whether the role of CD19 in regulating MAPK activation is affected by the absence of Lyn, purified splenic B cells from lyn+/+ and lyn−/− mice were stimulated by cross-linking the BCR, CD19, or both, and ERK1/2 activation was measured by detection of its phosphorylated forms. In lyn+/+ B cells, cross-linking CD19 or the BCR alone resulted in no or low-level phosphorylation of ERK1/2, respectively, whereas coligation induced a signal much stronger than that induced by either stimulus alone (Fig. 5⇓). 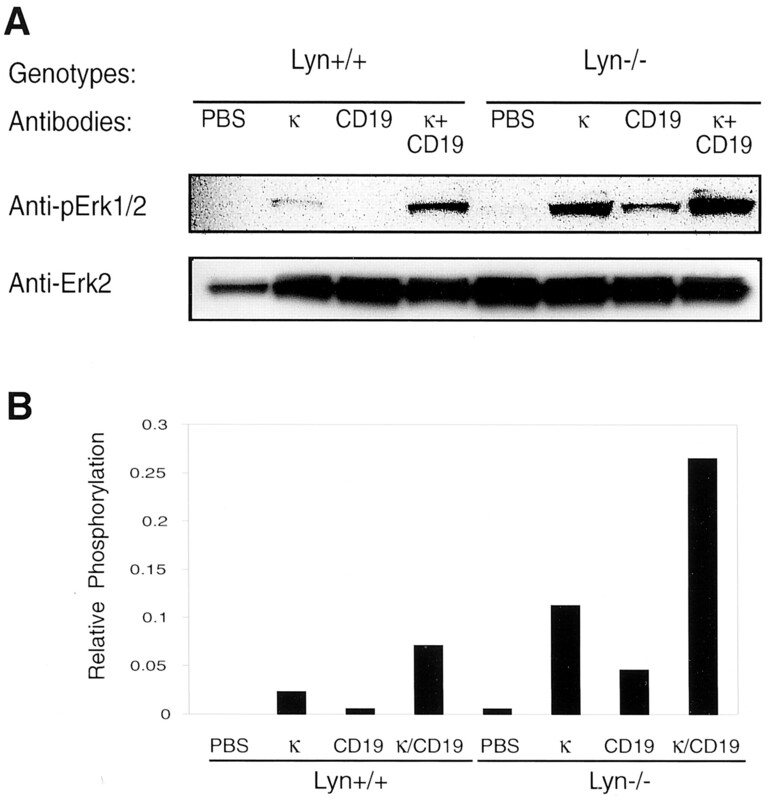 Ligation of the BCR on lyn−/− B cells induced stronger ERK1/2 phosphorylation compared with control B cells, a result consistent with the previously reported hyperactivity of ERK1/2 (20). Curiously, cross-linking CD19 alone in lyn−/− B cells induced a low level of ERK1/2 phosphorylation. Although the basis for this observation is currently being investigated, it is consistent with Lyn being a negative regulator of MAPK activity (10). Furthermore, the already strong ERK1/2 phosphorylation induced by BCR cross-linking on lyn−/− B cells was enhanced by coligation of CD19 with the BCR (Fig. 5⇓), clearly demonstrating that the role of CD19 in enhancing MAPK activity remains intact in Lyn-deficient B cells. Collectively, these data demonstrate that the ability of CD19 to enhance BCR signaling is not dependent on Lyn. Coligation of CD19 with the BCR enhances phosphorylation of ERK1/2 in control and lyn−/− B cells. Purified splenic B cells (2 × 106/lane) were preincubated with medium, biotinylated anti-Igκ, biotinylated anti-CD19, or both Abs together. FcγR binding was blocked using excess unlabeled 2.4G2. B cell stimulation was initiated by addition of avidin and halted after 2 min. A, Whole cell lysates were resolved by SDS-PAGE, transferred to nitrocellulose membranes, and probed with Abs specific for the phosphorylated form of ERK1/2 (upper panel). Membranes were stripped and reblotted with anti-ERK1/2 to reveal protein loading (lower panel). Results are representative of three independent experiments. B, The ratio of the intensity of the phospho-ERK1/2 and ERK1/2 signals for each stimulation condition was determined by densitometric analysis, allowing a comparison of the relative phosphorylation of ERK1/2 between samples. Having found the BCR-associated functions of CD19 to be independent of Lyn, we next examined the suggested role of CD19 in the activation of Lyn. If, as proposed, CD19 is essential for the amplification of Lyn activity in B cells after BCR ligation (30), then in the absence of CD19, Lyn activity should be diminished. We measured Lyn specific activity in CD19−/− and CD19+/+ splenic B cells before and after BCR ligation (Fig. 6⇓A). In control B cells, Lyn activity increased ∼1.6-fold after 2 min of BCR cross-linking. The activity of Lyn in CD19−/− primary B cells increased ∼1.9-fold after equivalent BCR stimulation (Fig. 6⇓A), demonstrating that the activation of Lyn in B cells is not affected by the absence of CD19. 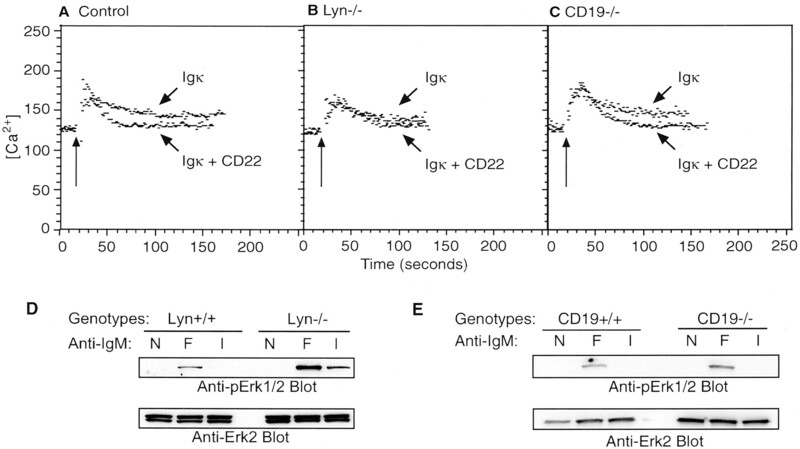 It is important to note that both the baseline and stimulated activity of Lyn are approximately equal in both cell types, indicating an approximately equal increase in the absolute activity in control and CD19−/− B cells. This result in primary B cells confirms that of a previous study using a CD19-deficient variant of the J558 myeloma cell line (43). In agreement with this result, we found the level of phosphorylated Lyn in CD19−/− and CD19+/+ B cells to increase comparably after BCR ligation (Fig. 6⇓B). Finally, the level of tyrosine phosphorylation induced by BCR ligation was similar in control and CD19−/− splenic B cells (Fig. 6⇓C), suggesting that many of the early steps in B cell activation are unaffected by the absence of CD19. Lyn kinase activity, phosphorylation, and total protein phosphorylation in control and CD19−/− B cells. A, Lyn kinase activity in CD19+/+ and CD19−/− B cells. Lyn was immunoprecipitated from normalized cell lysates prepared from control and CD19−/− B cells either unstimulated or stimulated with F(ab′)2 anti-IgM for 2 min. Lyn was then incubated with SOP and [γ-32P]ATP for 7.5 min. Radioactivity incorporated into the SOP was measured and normalized for the amount of Lyn protein in the assay as determined by Western blot. The relative mean Lyn-kinase activity from triplicate assays is plotted as the fold increase observed in each sample after stimulation. The data shown are from one of three experiments, all producing similar results. B, Lyn phosphorylation in CD19+/+ and CD19−/− B cells. Splenic B cells from CD19+/+ and CD19−/− mice were treated as in A. Lyn was immunoprecipitated from 100 μg of total protein, Western blotted, and probed to detect phosphorylated tyrosines before stripping the membrane and reprobing with anti-Lyn. C, Increases in total protein tyrosine phosphorylation in B cells from CD19+/+ and CD19−/− mice after BCR ligation. Splenic B cells from the mice were treated as in A. Protein (7.5 μg) from each sample was Western blotted and probed for phosphorylated tyrosines. Positions of molecular mass standards are shown on the left. The membrane was subsequently stripped and reprobed with anti-Lyn as a loading control. In addition to these phosphorylation studies, we examined CD19+/+ and CD19−/− B cells for functional consequences of Lyn activity. In particular, we tested the ability of CD22 coligation to inhibit BCR-mediated calcium flux in CD19−/− B cells and of FcγRIIB coligation to inhibit BCR-mediated ERK activation, as these activities have been found to depend to varying degrees on Lyn (10, 19, 20, 21). As expected, cross-linking CD22 with the BCR inhibited calcium flux in control but not lyn−/− B cells (Fig. 7⇓, A and B). In contrast with Lyn-deficient B cells, coligation of CD22 with the BCR on CD19−/− B cells inhibited calcium flux with a kinetics and to a degree comparable to that in control B cells (Fig. 7⇓C), supporting the notion that the Lyn-dependent, CD22-mediated inhibition of calcium flux induced by BCR ligation is not dependent on CD19. Finally, we determined whether the inhibition of ERK phosphorylation mediated by coligating FcγRIIB with the BCR was sensitive to the presence of Lyn or CD19. Control B cells showed greatly diminished ERK phosphorylation when stimulated with intact anti-IgM compared with F(ab′)2 anti-IgM (Fig. 7⇓D). Both stimuli induced equal levels of total tyrosine phosphorylation, whereas only intact anti-IgM induced FcγRII phosphorylation (data not shown). FcγRII was less inhibitory of ERK phosphorylation in lyn−/− B cells (Fig. 7⇓D), consistent with a role for Lyn in FcγRII-mediated inhibition in B cells (10, 27). CD19−/− B cells, in contrast, showed an inhibition of ERK phosphorylation similar to that of controls (Fig. 7⇓E). Collectively, these results are most consistent with the regulatory activity of Lyn induced by BCR stimulation being unaffected by the absence of CD19. Lyn-dependent inhibition by CD22 and FcγRIIB is intact in CD19−/− B cells. Splenocytes, previously loaded with the calcium-sensitive dye indo-1, were labeled with biotinylated Abs specific for Igκ alone or together with anti-CD22. The cells were subsequently stained with FITC-conjugated anti-B220. After establishing baseline indo-1 fluorescence by flow cytometry, receptors were cross-linked by the addition of avidin to a final concentration of 20 μg/ml. The resultant flux in intracellular Ca2+ in control (A), lyn−/− (B), and CD19−/− (C) B220+ cells was monitored for the indicated times. The plots depict calcium content as defined by fluorescence ratio as a function of time, and the experiment was repeated twice. Purified splenic B cells from control and lyn−/− (D) and control and CD19−/− (E) were not treated (N) or were treated with F(ab′)2 goat anti-IgM fragments (F) or intact goat anti-IgM Ab (I) for 2 min at 37°C. Total cell lysates were separated by electrophoresis, blotted, and probed for phosphorylated ERK1/2 (upper panel). The filter was subsequently stripped and reprobed with anti-ERK2 to show protein loading (lower panel). The rabbit anti-ERK2 Abs used in E belonged to a different batch than was used in D and Fig. 5⇑ and appeared to have less cross-reactivity with ERK1. The outcome of B lymphocyte stimulation is the sum of the positive and negative signals delivered through the BCR. Studies over many years have defined CD19 as a prominent positive regulator of B cell activation. These studies have included biochemical analysis of the consequences of coligating CD19 with the BCR (44) and analysis of B cells from CD19-deficient mice (15, 16). All available evidence supports the notion that CD19 functions to amplify signaling from the BCR. Conversely, the Src-related tyrosine kinase Lyn has been identified as a critical negative regulator or inhibitor of B cell activation. In mouse primary B cells, Lyn has the unique role of phosphorylating tyrosines within the ITIMs of several key inhibitory proteins, thereby providing docking sites for phosphatases that down-regulate B cell activation (11, 19, 20, 21, 22, 23). At certain points, however, CD19, Lyn, and the pathways emanating from them are thought to intersect. Lyn has long been suspected as the principal tyrosine kinase responsible for phosphorylating CD19 after B cell activation (37, 45). Similarly, CD19 coligation with the BCR intensifies MAPK activation (14), whereas the absence of Lyn results in hyperactivation of MAPK (10), suggesting a convergence of these pathways at this point. Ca2+ flux due to BCR ligation is enhanced in the absence of Lyn (19), but is either delayed or normal in the absence of CD19 (46, 47). A similar reciprocal relationship between Lyn and CD19 is apparent in the status of Akt. Akt is reported to be hyperphosphorylated in Lyn-deficient B cells (48), but hypophosphorylated after BCR ligation in CD19-deficient B cells (49). Given these apparently opposite activities for Lyn and CD19 in B cell activation, recent findings suggesting that CD19 phosphorylation depends entirely on Lyn (30) and that increased Lyn activity should depend on phosphorylated CD19 (30, 31) were surprising. If these observations and the resultant model are correct, one might expect that the regulatory activities of CD19 and Lyn would show a degree of interdependence and that the B cell phenotype resulting from the absence of CD19 or Lyn might show a degree of redundancy. The study reported here was undertaken to clarify the relationship between Lyn and CD19 in mouse B cells and to define points at which the regulatory roles of these molecules converged. To this end, we examined CD19 phosphorylation after BCR ligation in the presence and absence of Lyn and found it to increase and decrease with a kinetic essentially the same as in control B cells (Fig. 1⇑). We examined recruitment of the ancillary signaling molecule PI3K to CD19 after B cell activation and found this also to be unaltered by the absence of Lyn (Fig. 3⇑). Moreover, the enhanced Ca2+ flux and phosphorylation of ERK1/2 after coligation of CD19 with the BCR remained intact in lyn−/− B cells. The fact that we saw no effect of Lyn deficiency on CD19 function raises the question of whether Lyn has any role in CD19 activation after BCR ligation. We did find CD19 phosphorylation in a lyn+/+ B cell line to be blocked by the Src kinase-specific inhibitor PP2, indicating that Src-related tyrosine kinases are responsible for BCR-dependent CD19 phosphorylation. CD19 was also constitutively phosphorylated in a cell line containing a constitutively active form of Lyn, identifying CD19 as a potential substrate of Lyn. Thus, the often suggested role for Lyn in CD19 phosphorylation is either shared with or able to be replaced by other Src-related kinases found in B cells. A similar conclusion has been reached after analysis of Lyn’s other suggested positive roles, such as the activation of Syk (10). Our data demonstrate no unique role for Lyn in CD19-mediated signaling processes initiated by BCR ligation. We also examined the reported role of CD19 in amplifying Lyn activity in B cells (30, 31). In a current model, Lyn phosphorylates and subsequently binds to tyrosine 513 in the cytoplasmic tail of CD19 via its Src homology 2 domain. Lyn then phosphorylates tyrosine 482 of CD19 through “processive phosphorylation,” which allows recruitment of another Lyn molecule leading to Lyn transphosphorylation and/or autophosphorylation. The ability of Lyn to amplify its own activity via its interaction with CD19 is proposed to account for the majority of the increase in Lyn activity in B cells after BCR ligation (30, 31). Such a model might predict that the absence of CD19 would negatively affect the unique functions of Lyn after BCR stimulation. Our analysis of these activities, however, has failed to reveal any affect of the absence of CD19 on Lyn activity. First, we measured Lyn kinase activity in CD19-sufficient and deficient B cells after BCR ligation and found the magnitude of the increase to be independent of the presence or absence of CD19 (Fig. 6⇑). This result confirms the cell line data of Buhl and Cambier (43), who found the BCR-induced activation of Lyn in a CD19-deficient variant of J558L to be normal. We have extended these observations by finding that the ability of CD22 to inhibit Ca2+ flux and that of FcγRIIB to inhibit ERK phosphorylation after coligation with the BCR are also unaffected by the absence of CD19 (Fig. 7⇑). We and others have previously shown these activities to depend either entirely or predominantly on the presence of Lyn (10, 11, 19, 20). Although Lyn almost certainly interacts with CD19 in normal circumstances (for example, see Fig. 2⇑B), our data support the notion that this interaction is not essential for the function of either CD19 or Lyn. The biochemical independence of CD19 and Lyn reported here is consistent with the biology of B cells derived from mice deficient in either molecule. CD19−/− B cells have been reported to have either normal or diminished proliferation in response to BCR ligation (15, 16). CD19−/− mice also show diminished levels of IgM in serum and fail to generate germinal centers after immunization with T cell-dependent Ag in alum (15, 16). Lyn-deficient B cells, in contrast, hyperproliferate after BCR ligation (10, 27), and germinal centers form in lyn−/− mice after immunization (L. Blink and D. M. Tarlinton, unpublished observations). Lyn−/− mice also contain 10 times the normal level of IgM in their serum (28). These phenotypic traits are consistent with Lyn and CD19 acting independently in B cell activation. If Lyn and CD19 are critical mediators of negative and positive signaling from the BCR, respectively, and if the balance between positive and negative pathways is essential for normal B cell activation, at what points do Lyn-dependent and CD19-dependent pathways impinge on each other? Although our data are not exhaustive on this issue, we find intersection in both the regulation of MAPK and in Ca2+ flux. That is, CD19 is a positive regulator of both MAPK and Ca flux, whereas Lyn is a negative regulator of both. How this regulation occurs is not clear. Does Lyn act directly or indirectly on CD19 to diminish these responses? Because Lyn is responsible for mobilization of phosphatases to the plasma membrane, it is possible that Lyn may regulate CD19 activity via the activation of a phosphatase such as SHP-1 that subsequently modulates the phosphorylation of CD19. Indeed, the hyperphosphorylation of CD19 in Mev B cells has been attributed to the absence of SHP-1, although this affect is itself thought to be indirect (50). Furthermore, mice transgenic for human CD19 show a B cell phenotype and develop an autoimmune disease that is remarkably similar to that found in Lyn-deficient mice (28, 51, 52). That is, too little Lyn could be equivalent to a functional excess of CD19. The dephosphorylation of CD19 apparent in lyn−/− B cells (Fig. 1⇑D) indicates that Lyn does not act indirectly via, for example, activation of phosphatase to regulate the level of CD19 phosphorylation. This in turn suggests that Lyn exerts its influence on B cell signaling pathways parallel to or downstream of CD19. Several elements of our data are in direct contradiction to those reported previously on the codependence of Lyn and CD19 (30, 31). Most importantly, we find normal phosphorylation of CD19 in lyn−/− B cells and normal activation of Lyn in CD19−/− B cells. These results, therefore, question the model of “processive amplification of Src kinases” in B cell activation, in which Lyn is the obligate kinase for CD19 phosphorylation and CD19 is the obligate scaffold for the amplification of Src family kinase activation after BCR cross-linking (30, 31, 35, 53, 54). As mentioned above, the biology of both the mice and the B cells deficient in either Lyn or CD19 best fits a model of B cell activation in which the activation of Lyn and CD19 are not dependent events, a notion consistent with the biochemistry presented here. Although Lyn and CD19 may interact in the manner described (30), it is clearly not essential for the function of either. We have attempted to use experimental conditions similar to those previously reported (30, 31) to avoid trivial explanations for the observed differences. Although we have no explanation for the failure to see CD19 phosphorylation in lyn−/− B cells (30), the gene-targeted mice used in our experiments differ from those used by Tedder and colleagues (15), but several studies suggest they are indistinguishable (10, 16, 28). Our studies indicate, however, that previous measurements of Lyn kinase activity (30, 46) were suboptimal. In establishing conditions for measuring Lyn activity, we compared the peptide cdc2 (6, 7, 8, 9, 10, 11, 12, 13, 14, 15, 16, 17, 18, 19, 20) with the SOP (34) as substrates for Lyn and found a 22-fold difference in favor of SOP (S.-J. E. Beavitt and M. L. Hibbs, unpublished observations). Hck has also been reported to phosphorylate SOP more efficiently than it does cdc2 (34), suggesting that cdc2 is not the optimal substrate for assessing Src family PTK activity. It may be that the use of the cdc2 peptide diminishes the sensitivity of the assay and makes differences difficult to resolve. In conclusion, we have found that CD19 and Lyn exert opposite and independent effects after B cell activation. CD19 loss does not affect the activity of Lyn and Lyn is not required for CD19 phosphorylation, although it may play a role when present. However, we did find that Lyn exerts a negative influence on signaling pathways augmented by CD19 coligation with the BCR. If Lyn were to act downstream of CD19, this would allow greater flexibility in the extent to which various pathways were modulated in different stimulatory circumstances. We gratefully acknowledge the technical assistance of Amanda Light, advice from Margaret Veale, and discussions with members of the Tarlinton and Hibbs labs. ↵1 This work was supported in part by a grant from the National Health and Medical Research Council (Australia). Y.X. is the recipient of a postgraduate scholarship from the University of Melbourne. S.-J.E.B. is the recipient of an Australian Postgraduate Award and a CRC for Asthma Scholarship. M.L.H. is a Senior Research Fellow of the Australian Research Council and D.M.T. is a Senior Research Fellow of the National Health and Medical Research Council (Australia). ↵3 Abbreviations used in this paper: BCR, B cell receptor; PTK, protein tyrosine kinase; PI3K, phosphotidylinositol-3 kinase; ERK, extracellular signal-regulated kinase; ITIM, immunoreceptor tyrosine-based inhibitory motif; SHP-1, Src homology 2 domain containing phosphatase 1; SOP, Src-optimal peptide; MAPK, mitogen-activated protein kinase.